Jesse James in his famed pork pie hat with Larry, Curley, & Moe in Las Vegas. Anyone who knows the history of the West probably instantly recognizes this image. When Jesse James abandoned his children and his wife and his family, he freebooted himself west to Las Vegas. Jesse had in mind to re-establish his faded and flawed career as the high wire attraction his Civil War life on the partisan trapeze had prepared him to be. Jesse fancied himself as the focus of attention by adoring vacationers who would come from all those places where formerly he had been hunted as an outlaw. He also fancied the tigers and ostrich plumed showgirls from France he expected to surrounded him and keep him safe. In Las Vegas, Jesse was welcomed warmly by Ted Binion. Binion convinced Jesse to stop hiding his gold & hidden treasure in Oklahoma. Instead, Binion offered Jesse to stash his gold and hidden treasure inside a new machine Binion had installed in the center of his Casino for Dudes & Dudettes. Binion assured Jesse that, even though the public could see all of Jesse’s treasure through a glass window, the stash would be in the safest spot possible, because every time someone pulled the machine’s trigger to get the money, no one ever got anything out of the machine. Ted Binion convinced Jesse James he would need an act. 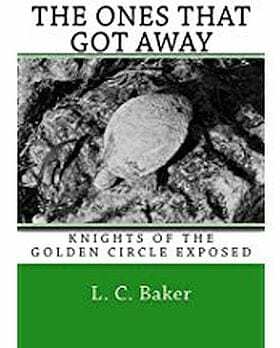 The Knights of the Golden Circle were due in town shortly for a secret convention in an undisclosed location. Binion knew about this from rocks with ciphered messages he had found in the desert. For all he knew, Binion said, they could be in Las Vegas already. The Knights needed to be hosted and entertained, and what the KGC liked best was inexplicable rituals. So Binion introduced Jesse James to Larry, Curley, & Moe. As seen here, Jesse James posed with Larry, Curley, & Moe in this photograph meant to promote the new act, the image taken during Jesse’s rehearsals with the trio. Shortly after this picture was taken, the KGC informed Binion they had enjoyed the act and planned to adopt some of its features in their programs. The KGC left town as unnoticed as they had arrived. 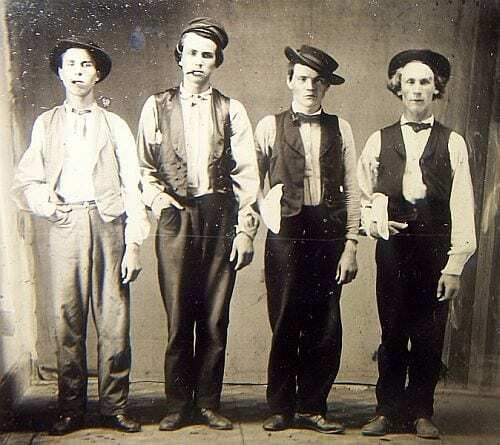 The name of the act – Larry, Curley, & Moe, starring Jesse James – just didn’t have enough ring to draw a crowd. Once more, Jesse faced failure in his life. Having run off from everyone he knew, Jesse was alone in his world, without friends…until Binion introduced Jesse to Bugsy Siegal. Bugsy was opening a new operation on the Las Vegas Strip. He needed some new acts. Bugsy asked Jesse, Can you sing? Only hymns, Jesse replied. No Good, said Bugsy. Can you dance, Bugsy asked. I can do a fast shuffle out of town, said Jesse. Doesn’t work me, said Bugsy. What can you do, asked Bugsy. Jesse replied, well, I’ve got this gang, or half a gang. The other half’s in prison. We rob banks. Gang, asked Bugsy. I already got a guy with a gang, named Sinatra. Finally, Bugsy Siegal advised Jesse James to leave Las Vegas, go out on the road, and work up an act. He assured Jesse, no matter if Jesse was wheeled back into his showroom on a gurney, Bugsy would hold open a spot for Jesse in his show. So Jesse James disappeared from Las Vegas. 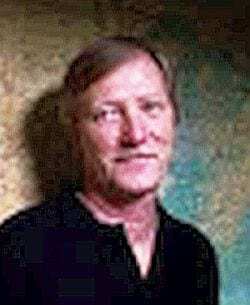 He hit the road, disguising himself as J. Frank Dalton. Then he got the idea to make himself famous – as himself. He got some roadies, and together they wheeled Jesse all around America on a gurney, whipping up a crowd of gullible curiosity seekers. By the time Jesse James had perfected his act and felt ready to return to Las Vegas, Bugsy Siegal had been murdered. Ted Binion was dead. And Larry, Curley, & Moe were gone. 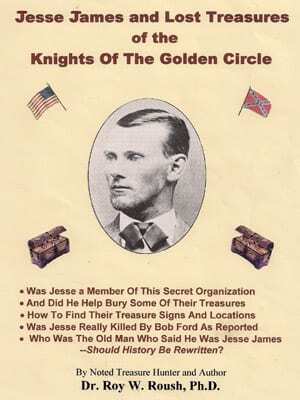 Jesse James died anonymously, as J. Frank Dalton. His show biz career never did get off the ground. But thank goodness for all those pictures of him that have survived the years. Without them, people would probably think he actually was killed by Bob Ford. DOWNLOAD a deconstruction of Chapter 2, taken from the transcript of the History Channel’s program Jesse James’ Hidden Treasure. The file is in .pdf format, and already contains initial commentary. Deconstruction of Chapter 1 appears in a previous posting. After reading, post your comments, observations, etc. below. There are 8 chapters to this program. After all the chapters have been de-constructed and commented upon, the assembled 8 chapters of commentary will be made available in a single document.